These used golf ball has been hand converted and retro-fitted with a small waterproof geocache container. Great for placing a cache near a golf coarse or driving range, you’re sure to get many golfers scratching their heads looking for this one. 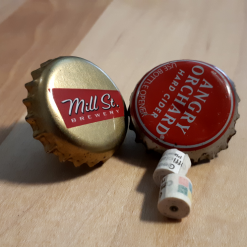 These geocaches come pre-loaded with 1(one) micro log sheet. You will earn around 10 “Tools of the Trade” Points for each of these items purchased. Learn more!